Painted as the direct result of a vivid dream experienced on Shetland during an artist residency, Kate Walters’ watercolours are at the intersection of art and shamanism. The delicate animals and life forms illustrate the meeting of the spiritual and material worlds — what can be felt as we walk through wild places, what might visit us in dreams, and what hovers on the edges of our awareness. A Fine Art graduate from Brighton and Falmouth, Walters is also trained in classical shamanism: a practice rooted in the understanding that the earth is alive and connected to all elements, and where dreams are considered a pure state which is untainted by ego. While Walters had planned on using oil paint and canvas for her residency, the inspiration from her dream made her reach instead for watercolours, which she describes as ‘the lightest medium and ingredient’ thanks to its absence of chemicals or heavy binder. In Shetland Notebooks this sense of lightness and purity is echoed by the soft brushstrokes, and the earthy hues and vibrant yellows which look like the pigments barely touched the raw paper before taking the shape of a leaping horse or ﬂuid serpent. Completed over the course of three artist residencies on Shetland in 2017 and 2018, the full body of work is infused with Walters’ love for the Scottish isles — a place to which she feels tethered, ‘a place of vision and clarity’. The animals depicted in the works embody a life in harmony with the earth, as well as spiritual representations of the principles of shamanism. The birds, reminiscent here of Shetland’s ubiquitous arctic tern, are seen as spiritual messengers, bestowing wisdom and connected both to the air and feminine elements. 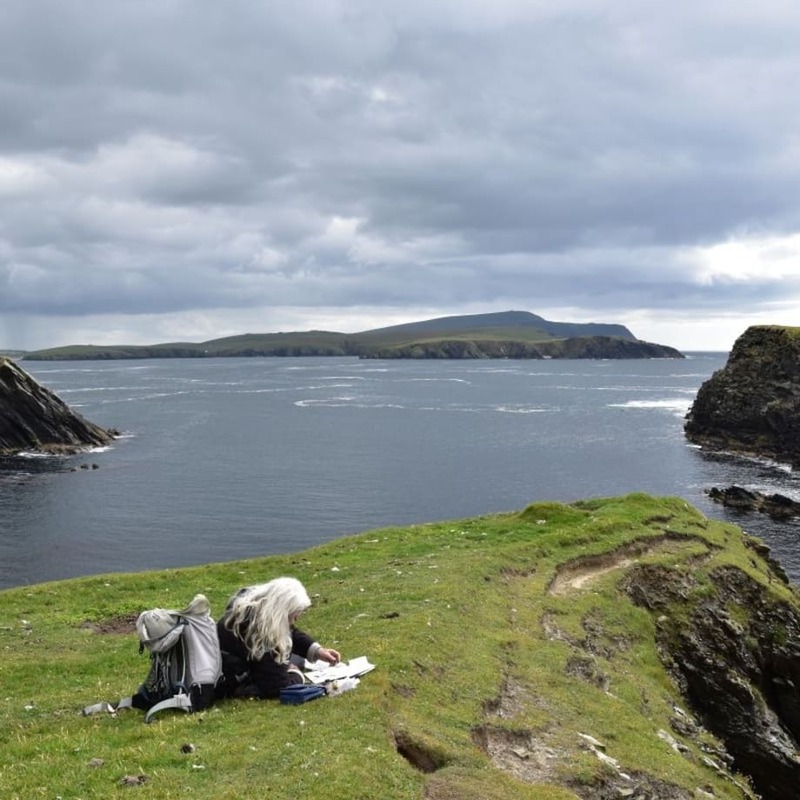 Bursting with energy and the promise of life, Shetland Notebooks connect Walters’ artistic language with years’ worth of spiritual practice. This exhibition coincides with the launch of a book Shetland Notebooks: Air Curl & Song which is published by Guillemot.